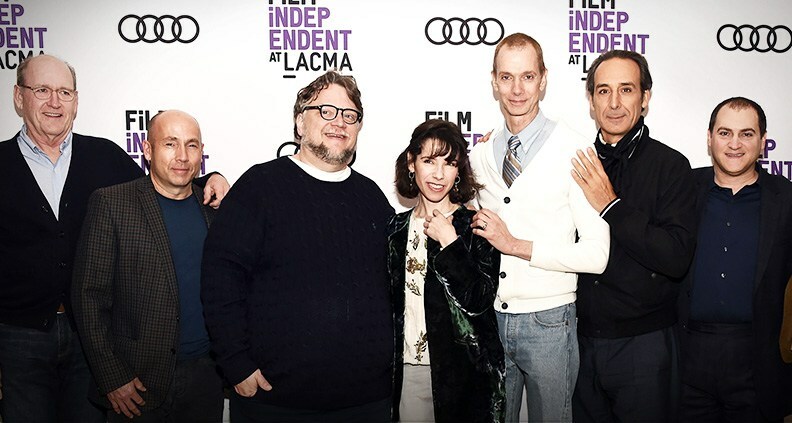 On November 14, Film Independent at LACMA held a free Members-only screening of acclaimed writer/director Guillermo Del Toro’s new monster-melodrama The Shape of Water, in advance of the film’s December 1 premiere. The theater was unsurprisingly packed—with audiences eagerly awaiting Del Toro’s post-film Q&A with Film Independent Curator Elvis Mitchell, which also featured castmembers Sally Hawkins, Richard Jenkins, Doug Jones and Michael Stuhlbag along with producer J. Miles Dale and composer Alexandre Desplat. Long praised for his fantastical and macabre approach to storytelling in such films as Pan’s Labyrinth (2006), The Devil’s Backbone (2001) and Crimson Peak (2015), Del Toro was a jovial conversationalist—cracking near-constant jokes as his collaborates earnestly attempted to discuss their roles in the film, arguably the best-reviewed of Del Toro’s entire critically-acclaimed career. But it all started years ago with The Creature from the Black Lagoon. A six-year-old growing up in Mexico, Del Toro was captivated by a broadcast of the 1954 Universal horror classic on local TV. “I fell in love with the creature,” he said, particularly enraptured by the doomed relationship between the aquatic muck-monster and the film’s female lead, played by Julie Adams. But it wasn’t until 2011 that that seed of an idea gelled into a concrete narrative—about a mute cleaning woman (Hawkins) working at a government research facility in 1960s Baltimore who falls in love with an imprisoned “fishman” (frequent collaborator Jones, acting under heavy creature makeup) and conspires to help him escape with the help of her friends and co-workers. Upon meeting Hawkins at a Golden Globes party, Del Toro told her: “I’m writing a movie for you where you fall in love with a fishman.” Hawkins replied: “Great!” For his part, Jones said that he was “attracted to the romance of it all,” saying that the only person he trusted to pull off the “love story in a creature shoot” was his old pal, Del Toro. Jenkins laughed that he got his role—of Hawkins’ character Elisa’s lonely, verbose neighbor Giles—when “Ian McKellan called in sick.” He observed that the hyper-verbal Giles was “a good role for a greedy actor,” noting the contrast between the number of lines given to him (lots) versus those given to Hawkins, his most frequent scene partner (zero). For the role of marine scientist/Soviet double-agent Hoffstetler, Stuhlbarg lamented that the script called for him to deliver his character’s most significant scene sans pants. Commenting on Jones’ ability to perform under heavy SFX, Hawkins praised the ectomorph performer’s physical strength. “And his strong odor,” joked Del Toro. 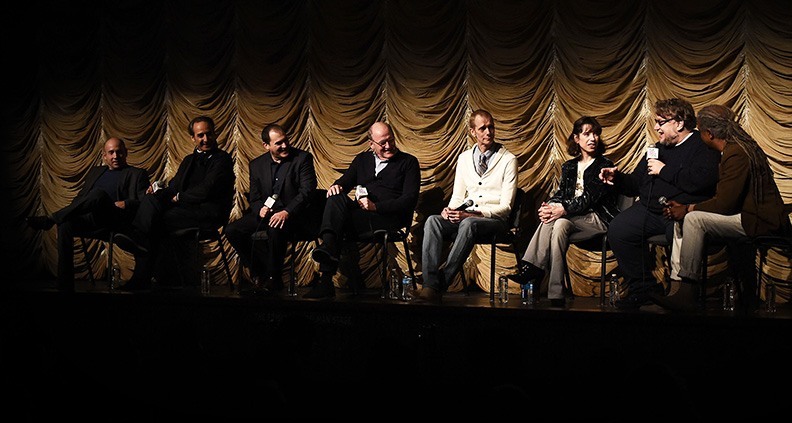 Turning to Desplat, Mitchell commented on the film’s ethereal score. “The first shot was the key for me,” said the composer, whose credits include The Grand Budapest Hotel and The Imitation Game, among others. “We worked a lot trying to find the warmth, thinking how the music would sound if it was underwater.” He added that the score’s primary melody was derived from the sound of waves. Returning to her character, Hawkins observed just how unique Elisa was as a fantasy heroine. “She’s got a job and she’s very happy. Then her heart expands when she meets the creature,” she said. “She’s got an inner music.” Del Toro commented on the difficulties of creating such an earnest piece of art, calling the film “a fairy tale for troubled times.” It’s easy to be cynical, but hard to wear your heart on your sleeve,” he said. 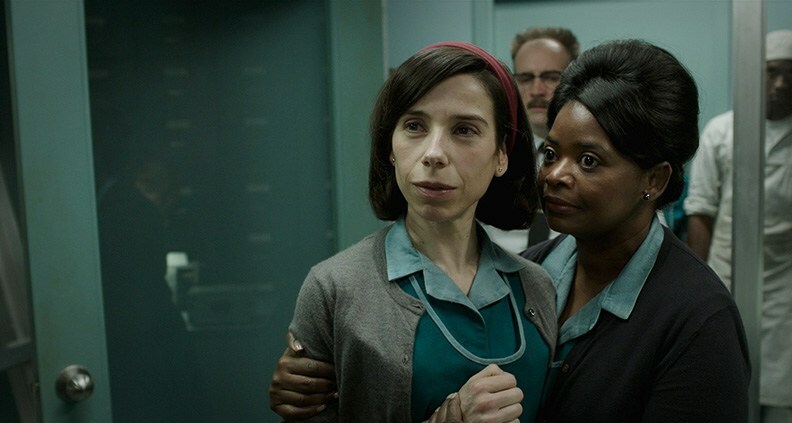 The Shape of Water opens in wide release this Friday, December 1, released by Fox Searchlight. Check out the film’s website and follow Guillermo Del Toro on Twitter for more details.